Shares of Apple dropped more than 2 percent on Friday, continuing the company's selloff after this week's earnings report, and dropping its market capitalization below oil giant Exxon Mobil Corporation. Shares of Apple had dropped as much as 2.4 percent in trading Friday afternoon, bringing its market cap to under $412 billion. Shares of Exxon, meanwhile, were up more than a quarter of a percent, pushing its market capitalization to more than $417 billion. The changes made Exxon once again  at least temporarily  the most valuable company in the world by market cap. Apple first passed Exxon's market cap in 2011, making the iPhone maker the world's most valuable company. It has held that distinction ever since, but shares of Apple have been dropping since late 2012 as investors fear Apple's slowing growth. 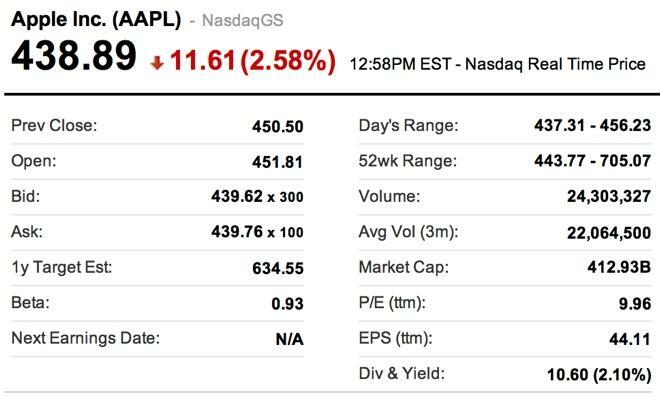 After Apple reported its holiday quarter on Wednesday, the company's stock dropped more than 10 percent in after-hours trading. Since then, the stock has not recovered, and is off more than $250 from its high reached in September during the iPhone 5 launch period. While the battle for market cap supremacy between Exxon and Apple is largely superficial, a more serious low point was also achieved by Apple on Friday: with shares dipping below $440, the company's stock reached a new 52-week low.